June 20, 2011, Shanghai Second Polytechnic University teachers and students, more than 40 people in total, came to visit the SBM headquarters. SBM business development manager, R & D personnel and sales staff, accompanied two teachers and the students to visit the company's product showroom, and made a specific explanation of the product working principle and main environmental characteristics. As the first university to establish electronic waste related professional institutions, SSPU undertakes a number of projects of the National Natural Science Foundation of China, 863 provincial (ministry) level projects and above, and has made outstanding achievements in energy conservation and environmental protection, closely serving Shanghai's economic construction and social development over the years to serve. The main body of the visit is sophomore majored in environmental protection equipment of SSPU. 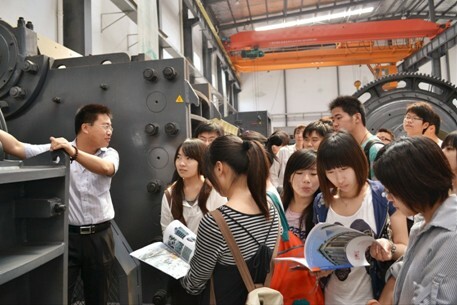 According to the professor’s introduction, they also visited a lot well-known enterprises before the visit, but SBM’s scale and advanced equipment, environmental technology left a deep impression on them. "Environment protection equipment major focuses on the use of professional equipment. We hope that through this form students can truly combine book knowledge and production, research and development practice. SBM’s advanced research and development in environmental protection offered students a good template. We sincerely hope to work with SBM on school-enterprise cooperation model base for in-depth research cooperation. " SBM researchers said that" Energy saving "has been the focus of R & D direction of SBM. SSPU’s work experience in the field of environmental protection equipment, and information superiority will provide help for SBM’s technical information, training, and professional skill. SBM will also provide training base outside the school, improve practical skills of school teachers by appointing professional and technical personnel of enterprises. During the exchange, the two parties undertook in-depth discussions on urban environmental protection equipment, such as the establishment of municipal waste resource. The proposal of SSPU brought a new idea for SBM on green development project.